Maman, elle va préparer le banho. It is often believed that code-switching is a bad thing. Most people think that they do it because their brain is lazy or they can't think of the word in the other language or that they are just not proficient enough in any of the two languages. This may, in some cases, be true, but for linguists, code-switching is actually a very complex and advanced phenomenon with rules and linguistic restrictions. So, if you do code-switch, you are actually performing a very complex task. It requires a very large amount of linguistic competence and is usually a good indicator of the said competence (see this great video of young adults switching between Japanese and English). Linguists have studied the why and how multilinguals do switch for a while now both in adult and children populations. But there still is a lot unanswered about the effects of code-switching, especially when it comes to multilingual families. 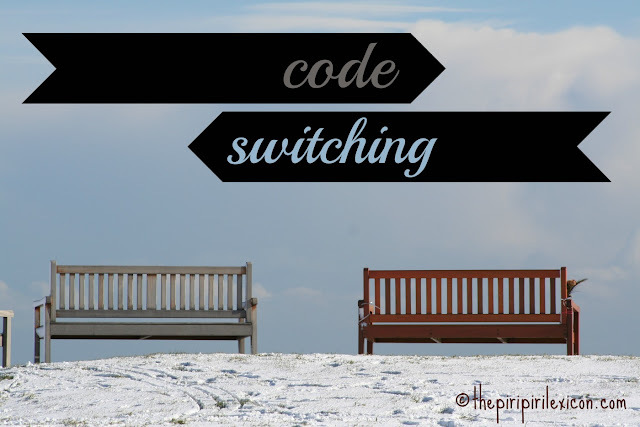 If you, as a parent, do code-switch when speaking to your child, does it affect his/her learning? In our family, code-switching is rife! I do try and stick to French with my daughter although I do occasionally repeat the odd German or English word she will use as an encouragement. She rarely uses them when speaking directly with me. She mostly does it when playing by herself and I happen to overhear. My husband though, uses a lot of English and French when speaking with LJ. She answers in French and they are off! The tone is set and getting out of it is difficult. Their chats are a code-switching heaven, a linguist's dream. They are both set in this multilingual conversations which are hilarious sometimes. So, can our code-switching affect our daughter's learning? A recent research article claims it does. It is a study by Krista Byers-Heinlein published in Bilingualism: Language and Cognition in 2012. She tested multilingual families with children growing up learning at least two languages. 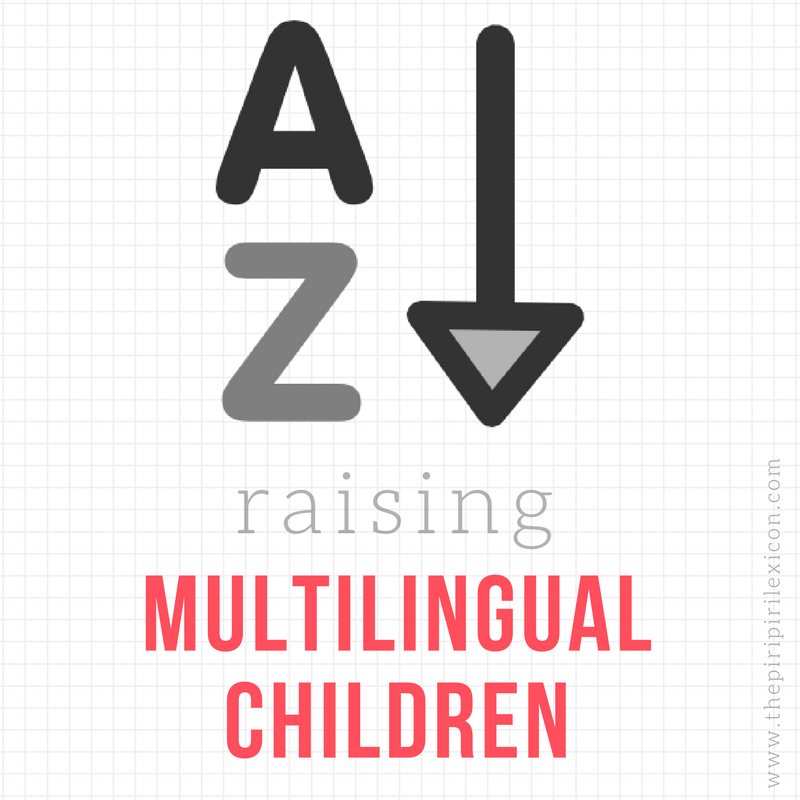 The methods parents used to raise their multilingual children varied and the children were aged betwen 1.5 and 2 years old. The parents had to self-report their language mixing in interactions with their child and the researcher measured the children's vocabulary. They found a strong link between parents who code-switched between languages more often and their child's vocabulary size (the number of words they know). This means that the more the parents switched, the smaller the kids' vocabulary (production and comprehension). They concluded that exposure to code-switching might "hinder" children's separation of their languages and the mechanisms that support early vocabulary learning. As parents, we do try and do what is best for our kids but sometimes, even with the best intentions, we don't quite get to acheive what we set out to do. At my first read, I thought: oh no, what are we doing to our child!? But after a closer read, I realised that the researcher had only tested one language (ie. they had only tested the child's vocabulary in English). You can read why I disagree with this here. What about if this other language was the dominant language of the child and they knew 3 times as many words in that other language? Would we still be talking about code-switching hindering anything? In addition, they relied on parents reporting their own code-switching. I know that parental reports are deemed accurate in some areas of language acquisition but they did not test or verify it in any other way. They made no observations of these interactions within the family nor recorded any parents-child conversations. I don't know about you but my husband is sometimes completely unaware he is speaking in another language! I am not sure he would be able to put a percentage on how often he switches language. Finally, this is all about monolingualism being the norm, yet again. Why would code-switching be something unusual? Monolinguals also code-switch between different registries (formal and informal, for example). Roxana A. Soto, from SpanglishBaby, wrote this excellent post about code-switching but ended it with a note saying that code-switching should be avoided in young children. There are communities where code-switching is the norm (Gibraltar, Lebanon or Morocco come to mind)*. Why avoid it? Children will, no doubt, encounter speakers who do switch and others who do not. Most speakers will work out what is normal and what is appropriate depending on their interlocutors. If you code-switch and people around you do too, your children will likely do it too and if their interlocutors understand, it is certainly not a bad thing. So, in conclusion, I would love to see this study replicated but with some of the things I highlight above changed or controlled for. If the results remain the same, then maybe we can talk about why this is happening and how we can help our kids. But as it stands, I am not convinced. The study mentioned is: K. Byers-Heinlein (2012). Parental language mixing: its measurement and the relation of mixed input to young bilingual children's vocabulary size: Bilingualism: Language and Cognition, 16,1. *There is a great discussion at the end of this post along the same lines. Thank you very much! It doesn't convince me either. I don't agree with the method used by Krista Byers-Heinlein, for several linguistic reasons that would be too long to list up here. – I know that her study reflects the input to young bilingual children, but her "young" is quite young for bilinguals (or multilinguals), therefore I would add another aspect that lacks here: the long term one. What about these children in two, three years? I'm very sceptical towards word countings in bilingual (very) young children, as this varies a lot and the comparison, as you say, is always made with monolonguals. It's like comparing apples with bananas... And as you say, code-switching can't be avoided. Especially if the whole family lives the bilingualism or multilingualism, and the social environment (does she mention this and take it into account? probably not that much as those children are pretty young...). As for the studies of code-switching, François Grosjean did publish several articles about this and I did post something about this too (http://expatsincebirth.com/2012/09/23/dont-worry-if-your-child-does-code-switching/). I did read your posts when preparing this one. It is a great post. Your point about the age is a valid one but she does not claim any long-term effects or says anything about the future, to be fair. The social environment is only taken into account as far as assessing how the children are exposed to the different languages as far as I can tell. Thanks for this post. I have noticed that I am already code switching with my son, even though he is only 20 months old. He has some words that he knows in Portuguese and so I find myself using them in English. I am still wrestling with whether this is a good thing or not, but it is good to know I am not the only one. Thank you for this article, it was very interesting. We are a bilingual family here too, I'm French, my husband Australian, living in Australia. I speak French to the children at home but often switch to English when my husband (he doesn't speak much French) or anyone else is around. I also do a bit of code-switching when it's just me and the kids. I've been wondering (and worrying) if this was a good thing or not. My children (1 and 3) understand both languages equally but my 3-year-old is showing a preference for English (it's not surprising, she gets English from her environment and her dad and gets French only from me) so she often answers to me in English (with a few French words thrown in) when I speak to her in French. I find it hard not to reply to her in English when that's the case. Thank you so much about your testimony MamaGwenm. This is exactly why I wrote this post. Even well meaning articles about code-switching can make parents feel guilty about doing it. I am sure your 3-year-old will figure it out very soon. Thank you for this. We do French (my husband) and English (me) at home, and definitely code switch (me more than him). I never feel completely comfortable with the bouncing back and forth, but you make an excellent point about the shortcomings of this study. My kids are still young (11 months and 2 1/2) and my daughter understands both languages well, but uses English more often. I have noticed, though, that since I increased my frequency of speaking French with her, she's started speaking in French much more. It's an interesting journey! We're winging it! I think code-switching takes a lot of skills and not everybody is comfortable with it. I am much less than my husband. I am sure you are winging it just fine!!! Ah si pardon si elle fait beau code-switching depuis toujours...elle dit toujours "zanniversaire feliz!" Je pense qu'il y a de enfants qui en font et d'autres qui n'en font pas du tout. Ce dont vous parlez pour la grammaire et la transformation des mots est aussi une sorte de code-switching. Cela ne concerne pas que le fait de mettre un mot espagnol dans une phrase francaise, par exemple. Merci pour cet article Annabelle (je ne me rends compte que maintenant que vous etes francaise, ahem !) sur un sujet qui semble faire beaucoup débat. Je suis entierement d'accord avec vous sur le fait que le code-switching n'est pas nécessairement un mal. J'ai tendance a penser qu'il est meme rassurant, dans le sens ou il prouve la capacité a basculer d'une langue a l'autre et a puiser du vocabulaire dans une langue ou dans l'autre. Ce n'est pas forcément un signe de confusion ! Il y a quelques années, j'étais fille au pair dans une famille bilingue francais-italien. Les fillettes que je gardais alternaient sans cesse les deux langues avec moi, je faisais de meme et ca ne posait aucun probleme au niveau du maintien et du progres de leur bilinguisme. J'habite maintenant en Angleterre et mon compagnon (qui est lui aussi francais) switchons sans cesse du francais a l'anglais et vice-versa, parfois meme au sein d'une meme phrase. Nous essayons simplement de ne pas le faire quand nous parlons avec des personnes qui ne parlent pas du tout anglais et que ca destabiliserait. Les enfants sont souvent capables de s'adapter a leur public et code-switchent dans des langues qu'ils savent que ce public maitrisent. Apres, tous les enfants ne fonctionnent pas de la meme maniere mais je pense que beaucoup de gens ont tendance a trop culpabiliser (consciemment ou pas) et a inquieter les parents vis-a-vis du code switching ! Thank you for this Annabelle! I am no expert with all this but my instinct tells me that code-switching is nothing to worry about! When my eldest daughter was about 2-3 she switched quite a bit, but now that she is 5 she only does it sometimes. Her father only speaks French to her, but he speaks English to me and I speak mostly English to her but with quite a bit of French thrown in for my 2 yr old. So I think we'd be considered a bit of a mess by some, but it works for us and feels natural. I am glad you can look at the research from a linguistic point of view and see it as it is. I love the idea of your LJ switching as she pleases...what a lovely thing to listen to...and the fact that she does it when she plays means she is truly comfortable and happy with it. No doubt if she meets someone who speaks only one of her languages, she, like my daughter, will immediately mirror that language accordingly, without even thinking about it. Maybe more research into this area will prove otherwise, but it is something I am just not going to worry about!